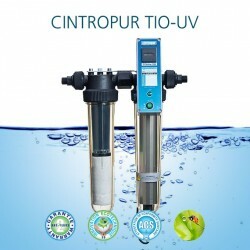 Water purifiers by pre-filtration of 1 to 300 microns, purification with activated carbon, and by sterilization with ultraviolet lamp: CINTROPUR models TIO-UV, UV 2000 and ECO, UV 2100, UV-DUO, TRIO-UV, UV 10.000. Cintropur UV range There are 6 products. 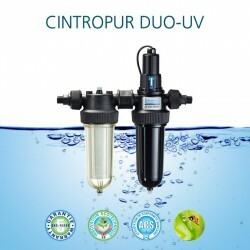 Water sterilizer ultraviolet high flow for rain water, well water, spring water, well water or network whose hardness does not exceed 17°F. 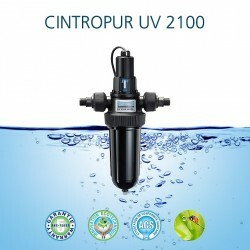 Cintropur UV 10000 is powerful and convenient maintenance. Supplied complete with wall bracket, screws, key bowl and installation instructions. 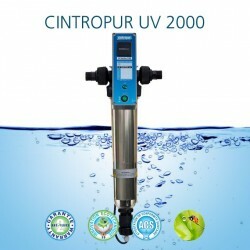 Aguagreen official distributor Cintropur uv. Free shipping. 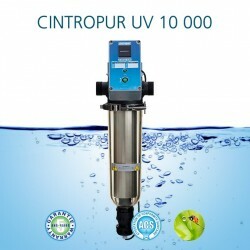 UV water sterilizer Cintropur UV 2000 by ultraviolet radiation. Good for purify rain water, well water, spring water, well water or network whose hardness does not exceed 17°F. 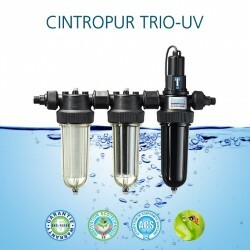 Equipped as standard with a 25 watt UV lamp and a quartz tube (UV diffuser). Comes with wall mount, bowl key and installation instructions. Free shipping.